Just like with real estate, dedicated servers are all about location, location, location. The location where your dedicated server is housed can make a huge difference in service quality and security. In the US, some regions are more prone to natural disasters than others—you wouldn’t want your dedicated server housed in Oklahoma’s Tornado Alley. Plus, the closer your dedicated server, the likelier you are to enjoy the best in customer service. In some instances, customers can even tour the facility where their dedicated server is housed, “visiting” their investment and seeing first-hand what kind of security measures are in place. 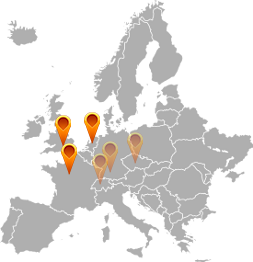 At SIMPLEXHOST, dedicated servers are housed in North America, Europe and Asia. The US offers a booming server hosting market where setup time happens at breakneck speed. Thanks to a premier provisioning team, servers can be up and running in 24-72 hours. Every single order is checked dutifully for fraud, which is why the 72-hour mark is sometimes a must. Setting up and installing your “just for you” server takes knowledgeable staff and prioritizing security so you can rest easy knowing your server is in good hands. Dedicated servers are by far the most powerful, fastest and offer the best quality. Many website owners and business owners don’t need everything dedicated servers have to offer—but enterprises do. SIMPLEXHOST only uses the latest hardware technology, and it’s all managed by a team with extensive server management experience. The right tools plus the right people equates to a dedicated server you and your enterprise can rely on. When you have a dedicated server, you’re not sharing resources with other clients. Your server is yours, and it’s expertly managed and cared for by your SIMPLEXHOST team. Resources are never split up amongst users, which means you get it all, from the speed to the performance. It’s exactly what enterprises need to provide their customers with the service they deserve. The SIMPLEXHOST network uses Cisco Systems routing products for all network layers. A completely redundant network is guaranteed, from beginning to end, ensuring superior service with a 1 Gbps connection. Where can you find SIMPLEXHOST dedicated servers? In three key locations within the US: New York, Los Angeles and Dallas. Hosting servers in such large metros means connectivity and the best technicians in the country. Each city boasts minimal natural disasters, plenty of nearby technical expertise thanks to fellow enterprises and universities, and plenty of commercial space to take care of your servers.